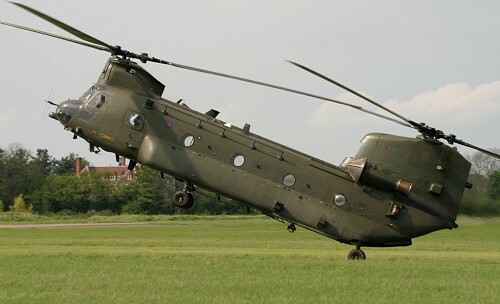 The Chinook HC2 is capable of carrying 10 tonnes of freight, up to 54 troops, and has three under-fuselage lifting points for carrying outsize loads. 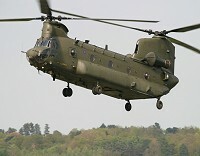 The RAF operates the largest fleet of Chinook support helicopters after the US Army. The Chinook Wing, which forms the heavy-lift element of the Joint Helicopter Command, is based at RAF Odiham in Hampshire. Odiham supports three operational squadrons, No 7 Squadron, No 18 Squadron and No 27 Squadron, and the Operational Conversion Flight (OCF). Two aircraft are also flown by No 78 Squadron from Mount Pleasant in the Falkland Islands on support helicopter tasks. Crewman - Sergeant Dave Parry. Flt Lt Carl Zarecky joined the University of Wales Air Squadron in 1988, where he flew the Bulldog T1. On completion of Initial Officer Training, he graduated from 1 Flying Training School at RAF Linton on Ouse having flown 182 hours on Tucano T1. He graduated from Defence Helicopter Flying School, having flown Gazelle HT2/3 and Griffin, and was posted to the Chinook Wing at RAF Odiham. He has served on all the Chinook Squadrons and is currently a Qualified Helicopter Instructor on 18(B) Squadron. He was the co-pilot for the 2004 Chinook Display. Flt Lt Zarecky has operated in a variety of theatres ranging from the Middle East to the sub-Arctic and has flown a total of 2100 hrs. Flt Lt Simon Cooney joined the RAF in Aug 1990, undergoing Initial Officer Training on 129 Course graduating in Dec 90. He completed navigator training in Feb 93 and graduated from 11 Rotary Wing Course at RAF Shawbury in Sep 94. Having completed No2 Chinook HC2 course at RAF Odiham, Flt Lt Cooney was posted to 7 Sqn in Jun 95, then to 18 Sqn where he served from Jun 97 until Jun 01. He then underwent a fast jet cross-over serving with 100 Sqn and 25 Sqn before returning to 18 Sqn in Sep 03. His total hrs are 2126, of which 457 are fixed wing and 1669 are rotary. Of his rotary hrs, he has flown 1472 hrs on the Chinook HC2 and is currently Combat Ready. Flt Lt Wyatt joined the University of Birmingham Air Squadron in 1987. He graduated from RAF College Cranwell in 1990 and was sent to 7 Flying Training School for basic flying training on the Tucano T1. He went on to fly the Hawk, before being re-streamed Rotary. At RAF Shawbury, he flew the Gazelle and the Wessex HC2. Posted to Northern Ireland, he served on 72 Squadron operating the Wessex HC2. During his tour, he flew an impressive 1800 hours. After a brief ground tour, he was posted to Chinook. He is a Combat ready pilot and training captain on 18(B) Sqn. To date, he has flown 1000 hrs on Chinook in a variety of theatres including Iraq, Northern Ireland and the Falkland Islands. Flight Sergeant Dunkerley joined the RAF in 1987. After basic military training he started his Aircrew training at RAF Finningley. Moving to RAF Shawbury, he completed his basic rotary training and was posted to 240 Operational Conversion Unit at RAF Odiham. After completing the Chinook OCU, he was posted to No 18 Sqn, RAF Gutersloh in 1989. He deployed to the Middle East, taking part in Operation Granby, the first of his two Gulf Wars. From 18 Sqn, he moved to No 7 Sqn at RAF Odiham in 1992. In 1998 he was selected for instructor training and returned to 18 Sqn. Deploying on Operation Telic to Iraq in 2002, he has been operated in many theatres. With over 4500 Chinook hours, he has more hours than the rest of the crew put together! Flight Sergeant Norris finally joined the RAF in Aug 1999. Previously, he served 25 years in the Royal Navy, initially as a submariner and from 1983 a Search and Rescue diver/crewman. He has over 2000 hours Wessex and Seaking and has participated in more than 300 rescues. 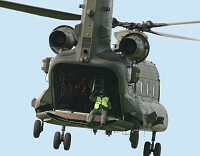 He completed No 15 Chinook course in May 2000 and was posted to 18 Sqn. He has flown 1300 hours in the Chinook and operated in diverse places such as Norway, Falkland Islands, Sierra Leone, Morocco and Iraq. He is currently the crewman Standards Officer. Sgt Parry joined the RAF in January 1984. After basic training he specialised as a Radar technician, working on the Rapier short- range air defence radar. In 1999, he changed branch and began Aircrew training at No 3 FTS. He was successfully streamed rotary and began helicopter training in 2000 at RAF Shawbury. Posted to the Chinook, he is a Combat Ready crewman on 18 (B) Sqn. He has flown 800 hours, operating in a variety of locations including Northern Ireland, Falkland Islands, Norway, and Iraq. 18. Fly towards crowd, depart downwind. Thanks to Sqn Ldr Dave Morgan, and the 2005 display team - Flt Lt Carl Zarecky, Flt Lt Simon Cooney, Flt Lt Olly Wyatt, Flight Sergeant Jamie Dunkerley, Flight Sergeant Sam Norris, and Sergeant Dave Parry for displaying the mighty Chinook. 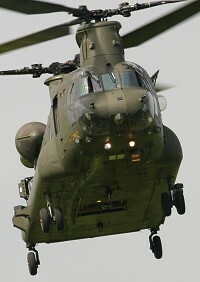 More details on the Chinook HC2 can be found on the Royal Air Force website , and 18 Sqn page.